There are different ways that facilities can charge residents for the services they receive. One way is referred to as the “all-inclusive” method. This means that rent and any additional services are included in a set monthly fee. 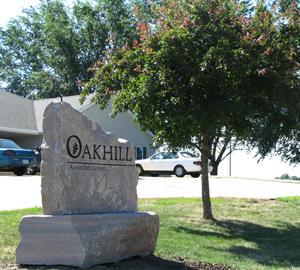 Oakhill Assisted Living fees are “all-inclusive” and no additional charges are found on your bill. Long Term Care Insurance is a special type of insurance plan that can help pay for assisted living. Long-term care insurance policies usually pay a certain sum of money to the facility for a certain period of time. The Home and Community Based Elderly Waiver Program for Assisted Living is funded through the Department of Human Services and is income-based. For an individual, your monthly income cannot exceed $2,022. We can show you how to arrange your assets to qualify, and we will assist you in completing an application. The Housing and Urban Development Grant helps qualified individuals pay housing rent for assisted living, based on the income of the individual or family. We can show you how to qualify, and will assist you in the application process. Iowa Finance Authority also helps qualifying individuals pay housing rent when funds are not available from the Housing and Urban Development Grant. The Sioux County Veterans Program Aid and Attendance Pension was established by the Veterans Administration to provide financial assistance to wartime veterans and/or their surviving spouses. If you served your country even one day during a period of war you may be eligible for this benefit. This is a monthly pension paid directly into the veteran’s or surviving spouse’s bank account. We can show you how to qualify, and guide you through the application. Private Payment – Oakhill Assisted Living also accepts private pay individuals. Payment sources can include income from pensions and retirement, as well as money from savings and investment accounts. Some families help with covering the costs associated with assisted living. In other cases, residents use the proceeds from the sale of real estate and personal property. We will discount the second room if a husband and wife rent two rooms Some of our rooms are equipped with a door between two rooms to create a two-room apartment. A couple may choose to use one room as a bedroom and the second as a sitting room, or configure the two rooms in any way that suits them.